The first arctic blast is coming in tonight so I will be hibernating. I do not like cold windy weather. Brrrrr. I know many of you are getting snow and that is why I live in the south and the older I get the colder I get. Y'all stay warm. On to this week's partay. Some great talent shared last week so let's look at just a few highlights. 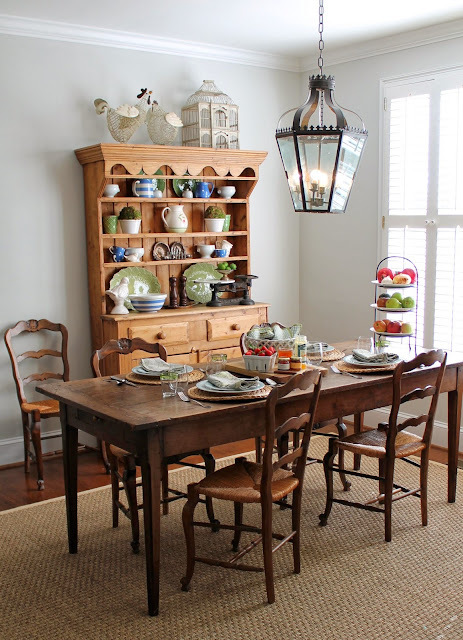 Designing Domesticity shared her pretty breakfast room with her wonderful vintage farm table. I love it and hopefully mine will be on the ship next Monday and will be in my home in a few weeks! Pat at Back Porch Musings shared her new winter look in her bedroom. Love the mix of patterns. I simply adore this finger knitted wreath by Recaptured Charm. 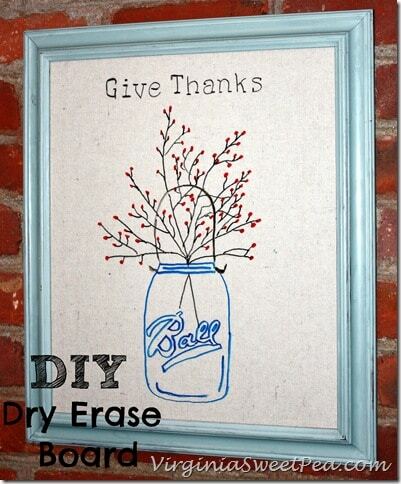 Cute dry erased board created by Sweet Pea. Cute vintage lunch box shared by Tazas & Cuentos. I know many of you are already getting ready for Christmas and here are some gift wrap ideas by Maddiebella Home. This pretty tree skirt was shared by Something Is Done and she shares the tutorial, too. Here is a pretty sweet treat by My Sweet Mission. Thanks everyone for sharing and if you were featured please grab a featured button from my sidebar. Thank you so much for hosting Kim! Great features! Fabulous features, Kim, love that farmhouse table! Thanks for hostessing the party. Thank you for hosting, Kim and stay warm! An artic blast is on its way here, stay warm :) Thanks for hosting! Thanks so much for hosting! I had a problem like that with my blog a while back(I'm on blogger) and it ended up having to do with an Adsense ad I had placed at the bottom of the post. Not sure if that will help you out, but as soon as I removed the ad the site went back to normal. Hope you get it figured out. Did your act up right away or later? My ad under the post has been there awhile and now I have other issues. Feedburner isn't working correctly is the main thing. thanks for hosting Kim, Blogger has some of us in a real mess! Hello Kim! Thank you very much for featuring my vintage lunch box! Joining your great party as always, thanks for hosting. Hi Kim, Your sidebar isn't showing at all for me. Thanks for hosting and I hope you get the blog problems worked out soon. Thanks for hosting Kim! Great features and lots of inspiration! I will be jealous of your farm table once it arrives. I've been looking for one for months now ... can't wait to see yours! Thanks for hosting, Kim. Thank you, Kim, for hosting! Great features! I love the farm table in the breakfast room by Designing Domestically.....so beautiful!! I can hardly wait to see yours :o) Thanks for hosting the party!!! Great features. The pumpkin streusel bundt cake looks sooo good. Thanks for hosting. Stay warm. Brrrrr . . . is right! I am so thankful to live in the Pacific NW with it's temperate climate. Rain is so much better than snow. Great features. I rather feel like I recognize that cute vintage lunch box. Could I really be that old? Thank you so much for all you do to make this a wonderful party to link up to. I thought I would freeze this evening while walking the dog. Tomorrow night is supposed to be worse. I'm not ready for cold weather! I was thrilled to see my dry erase board featured. You made my day! Thanks so much! Cute features. I never miss your cool party dear Kim, so thank you for having me again. It was 15 degrees here this morning, I am ready to head south! Thanks for hosting! Great party, lots of wonderful inspiration as usual. I have linked up two posts, one of my readers first chalk paint makeovers and a fantastic new free app I tested out where you can create amazing 2D rooms that even allows you to add light and shadows to look more 3D. Yes, SSS is not updating on my blogroll, as you say. I thought it was strange after a few days and figured you had taken a break...which you deserve, anyway!! Hope you get it fixed, fast! Thanks for hosting, love all the features! Kim, I meant to join the party last night, but then I got wrapped up in college basketball. Oh my! Hard to believe that season is already underway!! Anyway, better late than never, right? I'm so excited to be here with photos from my living room reveal. I've worked on this room forever, it seems, and it's still not quite finished--but it's finally finished enough to share. Thank you so much for hosting such a lovely party for all of us to share things. Have a wonderful Wednesday, friend!! What a great party. I see a gazilllion things I need, must check out after work. Wish I could stay home browsing through them all. Thanks for hosting such a wonderful party! Thank you for hosting Kim and for featuring my finger knitted wreath. I have joined up again this week! Thanks so much for the party, Kim! Hope you're enjoying a beautiful day! It's not just you, Kim, mine is doing the same thing and I think Brenda @ Cozy Little House is having issues with it, too - yours nor hers move up in my blog roll and neither shows the updated posts. Mine is doing the same thing on others' blogs' sidebars. Very frustrating. Hope someone can get it fixed soon. I'm amazed at the creative posts in WOW. I'm truly WOWed! Thanks for hosting. Thanks for hosting. I too am having issues with Feedburner or Blogger, not sure which. My posts don't publish to my FB and Twitter targets or show up on my sidebar. It's so frustrating! 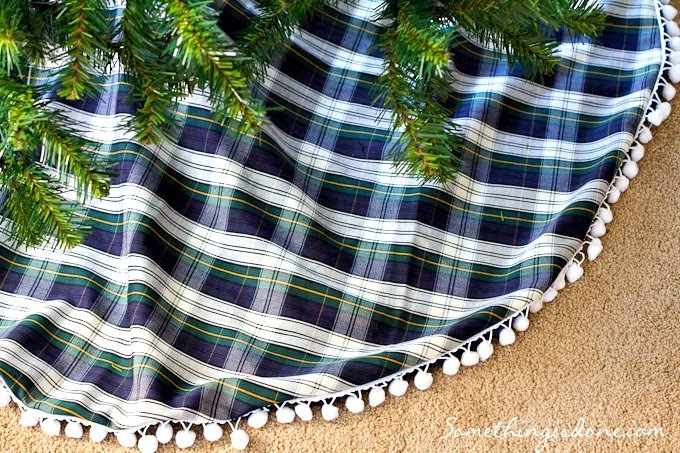 Thank you so much for featuring my tree skirt! Thank you so much for hosting! I LOVE your beautiful living room. You did a lovely job of mixing patterns and textures. Feedburner hasn't been working for a while! Early morning it may indicate 695 readers, and later in the day it indicates 1100 readers, the next time it may indicate 895 readers, then later 1600...different info several times a day! More and more I am asking myself if these "free" blog options are worth it? Wish I had a good answer. Thanks for hosting! Hi Kim. 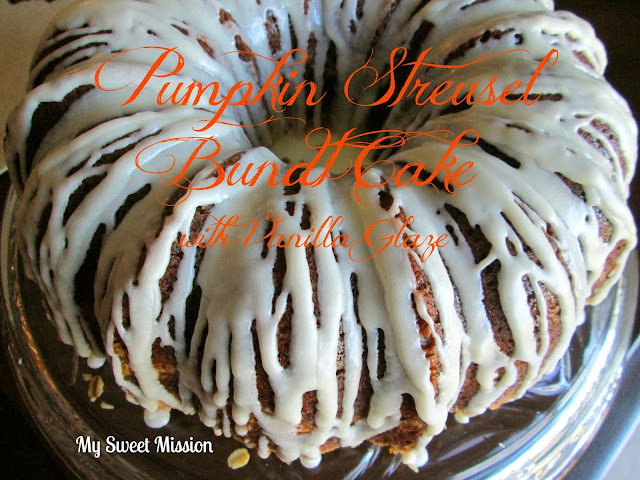 Thank you so much for including my Pumpkin Streusel Bundt Cake with your wonderful features! Hope you have a beautiful week. Thanks so much for hosting another great party hun, have a blessed day! :-) Stay warm! Thanks hosting another great party Kim! Already there are so many gorgeous projects posted in here. Thanks for hosting a party I've come to rely on for some great ideas. Hi Kim, I was happy to get all your blog posts back on my reading roll this week - I missed them! Thanks for hosting such a party - you always have so many great links! I've been fluffing nest(S) - figuratively and literally!